Marcel Breuer, Club Chair (B3), c. 1931, Leather and chrome pipe,Harvard Art Museums/Busch-Reisinger Museum, Photo: Harvard Art Museums. 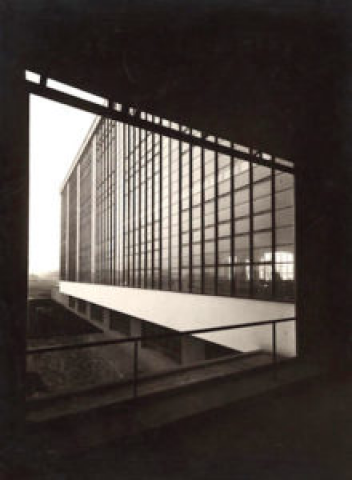 “Bauhaus Building, Dessau,” by Lucia Moholy (photograph) and Walter Gropius (architecture), 1926. Gelatin silver print. Photo: Harvard Art Museums/Busch-Reisinger Museum. 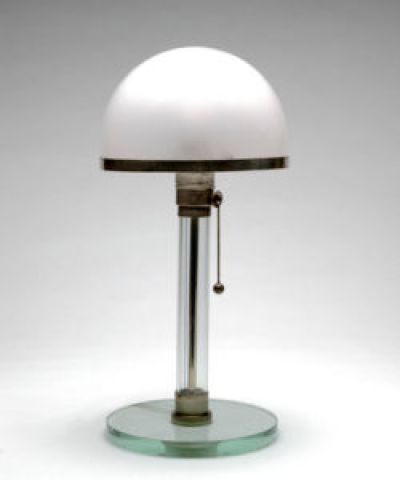 Wilhelm Wagenfeld and Carl Jakob Jucker, Table lamp, 1924. Transparent glass, opaline glass, mercury-silvered German silver, and mercury-silvered brass. Harvard Art Museums/Busch-Reisinger Museum. Photo: Harvard Art Museums; © President and Fellows of Harvard College. Hans Arp “Constellations II” relief, redwood panels with red paint, as displayed in Harkness Commons Dining Room, Harvard University, c. 1950. Photo: D. H. Wright. Bauhaus visionary philosophy sought to unify art, craft and technology, ultimately to rethink and restructure the elemental forms of contemporary life.It was like Camelot to artists, designers and architects, a space both mythical and more than a little magical. The Bauhaus was (and remains) a utopian concept, an idea that was about inspiration as much as it was dedicated to achievement. Some of this aura of promise wafts though The Bauhaus and Harvard exhibition on display at the Harvard Art Museums. The show celebrates the 100thanniversary of the founding of The Bauhaus. The Bauhaus faculty and students used the school as a venue for visual and material experimentation. These exercises had a transformative influence on design in the ’20s and ’30s. 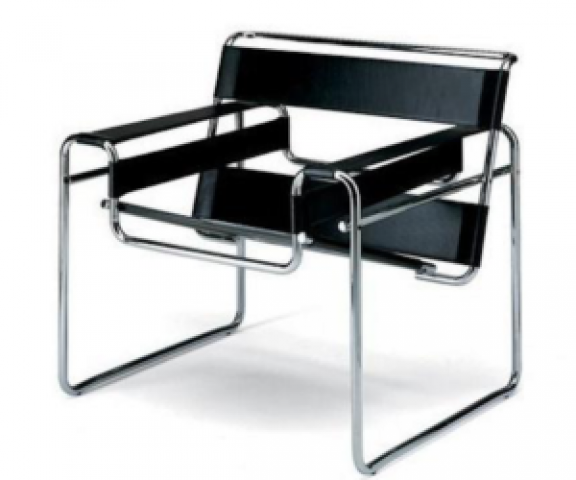 Bauhaus continues to resonate, still present in today’s design ethos and the spirit of contemporary culture. Bauhaus’s motto was collaboration. The school’s Holy Grail, its final goal, was to create elegantly integrated interdisciplinary works. The utopian ideal of the Bauhaus was for artists, designers, and architects to fashion a modern collaborative environment; to make their visual dialogue a coherent approach to creativity in all its forms. The machine was deemed a vital inspiration for industrial and product design. The Bauhaus is best known (in design circles) for reintroducing workshop training in lieu of traditional studio art education; for unifying artistic creativity and manufacturing; for emphasizing the value of functionalism in architecture; and for revolutionizing notions of streamlined industrial design. At its best, Bauhaus artists and designers collaboratively worked across different mediums and technologies. To members of the community, this integration was the natural progression of working with visual arts and crafts. The results are surprisingly varied. Both densely or sparingly drafted, Bauhaus drawings incorporate penetrating lines and/or primary colors often with black accents. 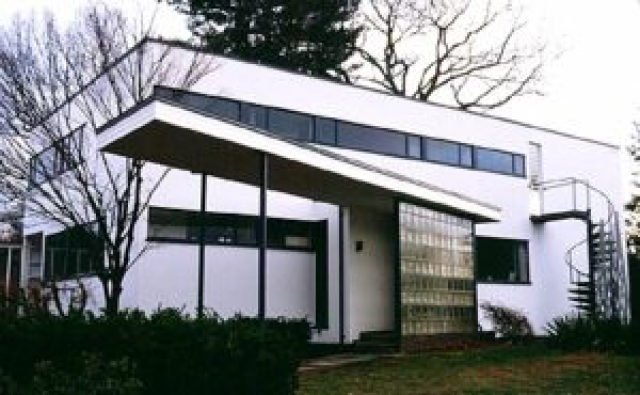 In architecture and object design, the Bauhaus style was a new aesthetic language of anti-ornamentation — minimalist geometric, abstracted functionality rather than elaborate, decorative figurative ornamentation. Bauhaus’ characteristics include minimalism, geometrical underpinnings, anti-ornamentation, handcrafted (but looks like mass produced), and function and form intertwined. The Bauhaus architects in particular made use of the latter approach as well. Harvard University has a long history connected to the Bauhaus. Harvard hosted the first Bauhaus exhibition in the United States in 1930. When founding director Walter Gropius became chairman of Harvard’s architecture department in 1937 — along with his colleague, faculty member Marcel Breuer — the University became something of a center for the Bauhaus in America. The exhibit proffers an enormous wealth of material, including rarely seen student exercises, iconic design objects, photography, textiles, typography, paintings, and archival materials. The school’s pioneering approach to art education is examined in detail as well. The curators also illuminate the ways The Bauhaus sought to revolutionize how we experience daily life.One of the Harvard Art Museums, the Busch-Reisinger, houses the largest Bauhaus collection outside of Germany. It was assembled through the efforts of Gropius, his wife Ise, and former teachers and students who emigrated from Nazi Germany. These included seminal figures Anni and Josef Albers, Herbert Bayer, Lyonel Feininger, and László Moholy-Nagy. Though there are a number of iconic Bauhaus-created objects sprinkled throughout the show, The Bauhaus and Harvard exhibition is strategically curated to focus more on the school’s faculty and students’ images rather than its objects. Nothing wrong with that: the works on paper are compelling expressions of the art and design school’s style and range, from drawings and prints to gouache and photographs. Also to be admired: the major contribution of women is underscored, unlike previous Bauhaus exhibits. Anni Albers’ mastery of textile design and craft have always been showcased as powerful creative projects and products of the Bauhaus. Throughout the school’s history, most of its women students and faculty were directed toward the Weaving Workshop. Lucia Moholy’s photographs are prominently displayed throughout the exhibition. Her pictures skillfully documented the iconic architecture and often exquisite products of the Bauhaus. These photos were valuable because they introduced the school’s legacy to a post-WW II audience. However, until rather recently, Moholy was seldom credited for her achievement, which was often attributed to her then husband Laszlo Moholy-Nagy or to Walter Gropius. Thankfully, this exhibit gets it right. Another major exception to male dominance was Marianne Brandt, who was a gifted metalsmith and early industrial designer who started as a student apprentice and eventually became a faculty member of the school’s Metal Workshop. Brandt’s pioneering household object designs, such as lamps, napkin-holders, and teapots are considered timeless examples of superior modern industrial design. It is disappointing that more of her work is not on display. The Harvard Art Museum’s teaching mission is well expressed in this exhibit; the educational aspects of the Bauhaus are wonderfully expressed through a visual narrative made up of student drawings and sculptural exercises. The first modernist building complex on campus, Harvard’s Graduate Center (1950) was designed by Gropius’s firm The Architects Collaborative. 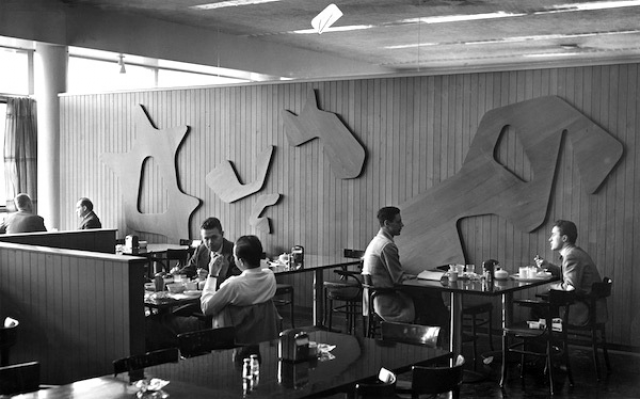 On exhibit in an adjacent gallery is Hans Arp’s “Constellation II,” a major site-specific redwood installation that had been commissioned for the Graduate Center dining hall. Here is abstraction transformed into a kind of visual poetry, bringing a bit of whimsy and liveliness to what was a very uncommon student eating space. The graduate student dorms and student center also included murals by Joan Miro and Herbert Bayer and plaid bedspreads by Anni Albers. Bayer’s mural (brilliantly restored) demonstrates his gifts of geometrically striking graphic design and painterly precision. The Graduate Center project integrated, wonderfully, an impressive number of Bauhaus ideas, incorporating modern art, architecture, and design. Today, the building is Harvard Law School’s Caspersen Center. The Bauhaus at Harvard is about origins, demonstrating how the thoughtful creative qualities and refined techniques of our contemporary visual and material culture were collaboratively developed a century ago. What’s exhilarating is that The Bauhaus’ artistic joyfulness and charisma is not just a memory — seeing this show generates a sense of spiritual elation, as if you are experiencing the invention of modern art and design. The Goethe-Institut Boston is promoting Bauhaus centennial events at a number of New England institutions, including Radical Geometries: Bauhaus Prints, 1919–33 on view to June 23 at the Museum of Fine Arts, Boston; and Arresting Fragments: Object Photography at the Bauhaus on display from March 28 to September 1 at the MIT Museum.